This lovely 3 bedroom villa with private pool is in an excellent location, just seconds from the sea and within 10 minutes walk of Protaras centre and Fig Tree Bay. Inside, the villa is nicely furnished with modern decor. The ground floor features an open-plan sitting area, dining area and a fully equipped kitchen. There is also a W/C on this floor. Upstairs, there are 3 spacious bedrooms. The master bedroom has a double bed and en-suite bathroom, another double bedroom and a 2 twin bedroom. All bedrooms have fitted wardrobes and bedside tables. There is a family bathroom with bath tub and overhead shower. Outside, the sunny garden and pool area provide plenty of space for sunbathing, relaxing and outside dining. Satellite TV and free WIFI are available and the villa has full air-conditioning throughout. 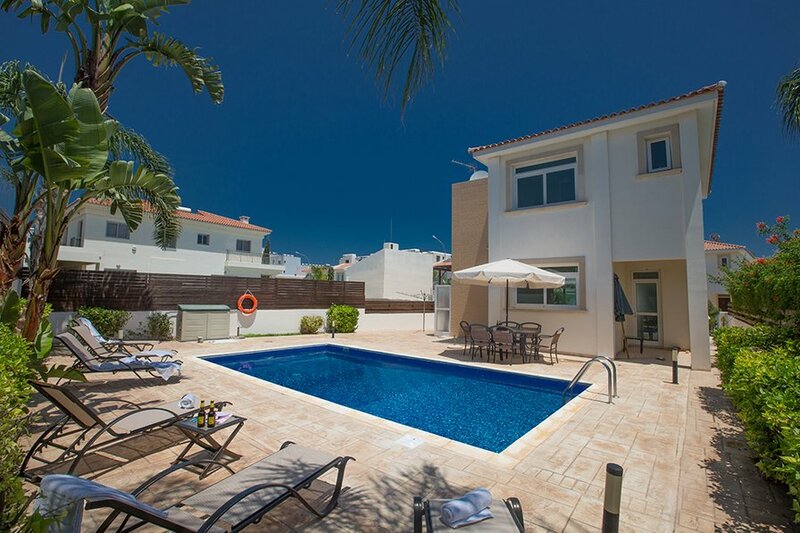 Overall, this is an excellent villa for families or groups of friends who want to be close to the resort centre and beach. Just 10 minutes walk from the main Protaras strip, a wide variety of restaurants, bars and the famous Fig Tree Bay beach, this area of Protaras is an excellent central location within easy walking distance to all the resort amenities and beaches.